Solo saxophone is perfect for all occasions. Wedding ceremonies, receptions, private functions, parties, shopping centres, markets, etc. Steve plays with pre-recorded double bass tracks to provide an authentic sounding jazz performance. All double bass backing tracks are actual recordings of Steve playing the double bass, no computer generated tracks. He can also play solo saxophone unaccompanied. A small battery powered amplifier is used to play the backing tracks. This allows a totally portable performance. Moving to different locations is no issue and no power is required. Steve plays a mix of cool jazz and latin standards and groove tunes. Special requests are also catered for. A great sounding jazz duo with just one musician! Sydney Saxophonist Steve Arié is one of the most versatile jazz musicians in Australia. 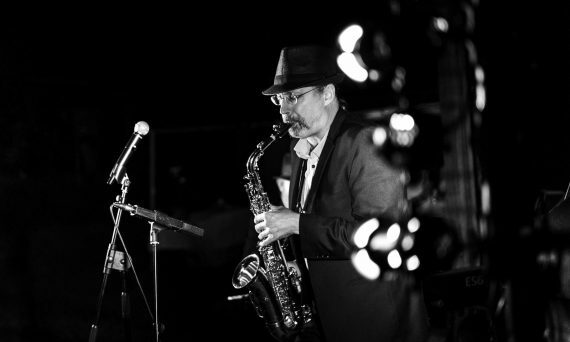 After more than 20 years as one of the most in demand jazz double bass players, Steve reinvented himself as a quirky saxophonist and vocalist with more than a nod to the styles of Chet Baker and Paul Desmond. He has toured both nationally and internationally. Highlights include two performances at the prestigious Chicago Jazz Festival. As well as The Hothouse Jazz Club Chicago, Steve also performed at The Kennedy Centre for Performing Arts (USA). Furthermore Steve has played at Edinburgh Fringe Festival (Scotland), Ruhrfestspiele (Germany), Queenstown Jazz Festival (New Zealaund) and jazz and music festivals throughout Australia. Contact Sydney Saxophonist Steve Arié.